Who will face Franz Jägerstätter in the Championship Round of Lent Madness 2017? That’s the question of the day following Franz’s narrow victory over Stephen 53% to 47% in the first of two Faithful Four matchups. Two things are certain: 1) Franz’s opponent will either be Amelia Bloomer or Florence Nightingale. 2) Today’s Celebrity Bloggers, Laurie Brock and Anna Courie, are terrific writers and we’re grateful for their witness. To make it to the Faithful Four, Amelia Bloomer stymied Philipp Melanchthon, Fanny Crosby, and Raymond Nonnatus while Florence Nightingale made it past Anselm of Canterbury, Henry Beard Delany, and Martin Luther. In case you missed the final in-season Monday Madness episode of 2017, watch it here. Tim and Scott are not BOTH in the Holy Land for Holy Week, but one of them is. And it’s definitely not Tim. Because he’s busy. Imagine a world – or a church – without women’s voices. Without the laughter of Sarah, without the judgments of Deborah, without the mutual joy of Mary and Elizabeth, and without the Easter proclamation of Mary Magdalene. Amelia Bloomer didn’t have to struggle very hard to imagine. 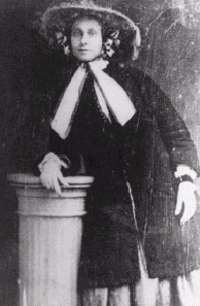 In the 19th century in which she lived, women in the United States were silenced by culture, by law, and by religion. Amelia, however, was not willing to allow others to silence the voice God gave her. Amelia began using her voice as a leader in the temperance movement, a movement in America that, seen through our own 21st century experiences, can seem extreme. Amelia and those who advocated for temperance wanted alcohol sales banned. Amelia herself would not dine in a home where alcohol was served. Amelia had seen, in a country where women had little if no opportunity to work outside the home, her gender dependent upon wages brought home by husbands, the same wages readily spent at pubs and bars where pay was distributed. Cities and towns encouraged establishments to sell alcohol while spending no money on public wells for clean water. Amelia has heard the voices of women abused and neglected because of alcoholism. In reading biographies of Amelia, we likely wouldn’t know how the voice of God guided Amelia. She rarely wrote about the influence her Episcopal faith had on her viewpoints or even how her faith molded them. She was, however, a devout member of the Episcopal Church in Seneca Falls and frequently clashed with other women’s rights advocates for her unwillingness to condemn the Church outright, arguing she preferred to reform the Church from the inside as a member. Throughout her life, Amelia was involved in a vast array of charitable and church organizations. She had sewing parties to make clothes for those in need. She and her husband welcomed several orphans into their home, worked for church ministries, and continued her dedication to temperance, often lecturing inebriated men on the street of the dangers of alcoholism and offering them help. What would the world and the church be like without women’s voices? Thanks to the work of women like Amelia Bloomer and those who continue her work to strive for justice, dignity, and equality for women in the church and the world, may a reality without women’s voices never be. Florence is tired. And cold. So bitterly, bitterly cold. She pulls her cape around her more tightly with her left arm as her right arm lifts the lamp that lights her way to the infirmary. Florence is lost in her thoughts. She has wondered, yet again, how she can help so many soldiers. They are all so sick. The pain and anguish of their plight sits heavy on her heart. In moments of doubt, she wonders how God can be found on a battlefield….. Her boot sticks once again in the mud on her way. She is irritated by the inconvenience. Will the weather not even bend to help her improve conditions? She sighs as she lifts her shoe and shakes off the debris. Tonight will be difficult. A new load of wounded has been delivered to the hospital and Florence knows it will be a long night as walks between the wounded, and teaches the young nurses to wash, wash, wash. Florence wonders how hand washing can be such a foreign concept. She wonders why fresh air, clean hands, and clean linens would be such a revolutionary idea to taking care of their fellow man. She wonders how to teach people the basic necessities of life that should be available to all. She wonders if her fellow doctors and nurses see the face of God in their patients as she does. Florence wonders how to make them see beyond the lumps of misery on their cots. Florence takes a deep breath as she opens the doors to the ward. She knows from experience that the stench of death, decay, rotting flesh, old (and new) blood will steal her breath and make her stomach heave. Even an old nurse will never forget that unique sickly-sweet smell of skin that is no longer healthy. The skin that seems to turn first bright pink, then green, and finally black as it rots before their eyes. She is frustrated that the hospital does nothing to address the vermin that are attracted to death. She knows that it is vital to the repair of the body that those broken cells be nurtured in an environment that is clean both in air, surroundings, and supplies. Florence knows that in a room that is overflowing with with the sick and wounded, the environment is often the largest hill in her b attle towards health. *John represents one of many patients Florence served and is not to be confused with a specific individual. The writing here is the creative license of the author to best represent the times and environment in which Florence worked. Any errors are my own. Florence Nightingale statue: by Arthur George Walker, R.A. 1861-1936. 1910. Bronze. 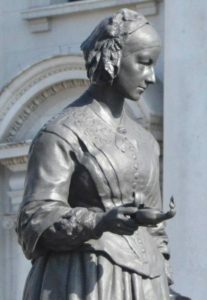 Part of the Crimean War Memorial located facing Waterloo Place at the junction of Lower Regent Street and Pall Mall, London. 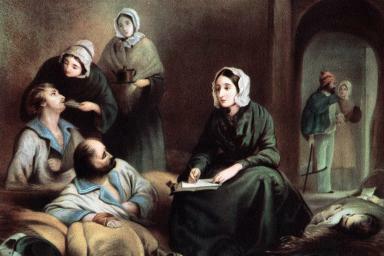 Florence Nightingale painting: Florence in Scutari on 1st January 1855 writing letters for wounded soldiers of the Crimean War. Getty Images. 166 Comments to "Amelia Bloomer vs. Florence Nightingale"
I am a nurse, that does not mean I work as a nurse, as I do, but I AM a nurse! Go Flo! Your reply brought tears to my eyes for I too AM a nurse. It is my calling, not just my vocation and Florernce Nightingale has been my mentor. I, too, AM a nurse! Our calling is not just a job…it is who we are. Bless Florence for leading the way for modern nursing. But also blessings to Amelia for speaking out. Like others we know, they both PERSEVERED!! Ooop, my spelling fingers are off today….She Perservered!!! Amen. All my thoughts too. I AM a nurse. I found it was a hard decision between the two. Both were brave and angelic trailblazers. To be heard as women, in that male dominated time, shows you that God really raised them up! Even though both from the 19th century both of their ministries ring true for today. The sign in the bathroom says wash your hands. And to many lives are being cut short by alcohol and drugs. Yes indeed, from this hospice RN – onward Flo! My mother was a nurse, awarded the Nightengale pin on graduation as the student who most embodied her spirit. She passed that spirit of caring onto me. As a medical student and resident I was accused of caring “too much” for my patients. I had to vote for Florence. Who give all they have for right. Plant some faithful, holy seeds. To make choices, use their minds. Led to hope for those oppressed. Soldiers, wounded, ill and weak. But strong Florence won at last. For compassion, for lives saved. Caught on holy fire again. I will miss your hymns. They have been an inspiration. Please, a collection Lent Madness hymns! The hymns will be available in PDF format on the website of my community, The Community of the Transfiguration at ctsisters.org. The SEC has said they will include a link to that site. I’m grateful that you want to have the collection. This has become the best part of my Lent mornings. The hymns carry me throughout the day, reminding me of that “cloud of saints” that surrounds us. Let me also aspire to be such a witness. Thank you Diana. You can rest assured that you too have been serving the Lord. As with many here, they have become a new way to start my day. Thank you so much . And thanks be to God for blessing you with this talent. The last stanza gave me goosebumps. I am delighted to learn that your hymns will be available to us! I have looked forward to them every day during Lent Madness and am hoping to include them in our worship at St. Bartholomew’s in Estes Park, Colorado. Thank you for the gift! Diane, that means a lot to me. Thank you. Another awesome hymn. Thank you. such a great hymn today!! Fantastic Diana. You have done such a lovely job of bring the saints to music and giving us a hymn tune to hum, whistle or sing each day of Lent Madness. Thanks and blessings to you from East Tennessee today. Beautiful words to hymn tune to honor Florence and Amelia. What great women of God. I look forward to your hymns each day. Your lyrics are so thoughtful and well done. They help me focus on these great lives and sometimes have helped my decision making. Your words always inspire and help clarify my thoughts. Thank you. As a former hospital and hospice chaplain, my admiration for nurses is unbounded. Go Flo! Florence has been my hero since I was a child and read her biography. I cannot abandon her now. She did as much for women by example as Amelia along with making the medical world understand cleanliness and infection. I am grateful for that today. Both women deserve a vote and choosing one was hard however, I voted for Amelia because she was one of the first women to see the damaging effects of alcohol on families. I also admire her for choosing to reform the church from within instead of condemning it. Her voice for women shines through her example. Me too! Very well said and my thoughts exactly! Nice seeing you here. Have a wonderful day and I’m sure I’ll see you later this week. Although I admire Bloomer, I’m still for Nightingale…nurses are the best! I just hope that Franz wins the entire thing. He did things no one else did. I want him to win. Me, too. What a guy! Franz is my guy this year! Florence seems the obvious winner, but I voted for Amelia because Florence was one of the women she championed and because one of my grandmothers was active in the WCTU. Amelia for the win! Without the bold leaders of the Women’s Rights Movement, half of us would not be where we are today. And I am grateful for their hard work! We still have far to go, and we know it. God bless Amelia Bloomer, Stanton, Anthony, Mott, Paul, and all of the others! It was so good that Amelia was put into the gridiron! I am sure at some point in the past I heard of her, but I had forgotten. And someone like Amelia should never be forgotten! Had it not been for the temperance movement, there would not at that time have been the triumph of votes for women, and without that push, who knows when women would have gotten the vote???? It took some kind of national crisis to get progress in these matters. Had there not been a temperance movement, and hence no votes for women at that time, there likely would have been no Frances Perkins, and God only knows what would have happened to the world without her innovative ideas which jump started the New Deal. When it comes right down to it, I must vote for the one who gave such a positive example to us for love, concern, cleanliness, and seeing Jesus in the sick, the broken, the wounded. Such a high calling. Who has not benifitted from a nurses’ tender touch, soothing words, and voice of courage in the face of pain and debilitation? Florence for the Golden Halo! While I have the deepest respect for Florence and all nursrs, Amelia paved the way for women to be doctors, lawyers, and any else we want to be. I could never be in the medical field. Blessings on all health workers and thanks for the beautiful meditation of walking through the camp. I am struck by Amelia’s presence in the trenches of daily life. She had to make those little decisions that are so easy to avoid in the midst of relationships and finances. And those choices make all the difference in being God’s hands in this world. Amelia bloomed where she was planted! Never say never. God gives us the desires of our heart. After dropping out of Athletic Training as an extra curricular at U of Alabama because we were going to have to start learning anatomy-and I couldn’t do that, I found my call to become an RN. It was scary, and my first class was Anatomy. With a 13 month at home and 5 wks in to my second pregnancy, I made an A. Even facing the cat dissection as the leader of our pair. I am now a Nurse Practitioner. God put the desire of Nursing in my heart, and while I have worked very hard for my achievements, I have and do believe the Spirit’s work in me has been my guiding force to become a successful healthcare provider. Cheers from one NP to another! When you feel the Spirit’s call, you can do anything. Go Flo! Amelia May be notable for her trailblazing but….the evidence that her faith was a factor is that she was Episcopalian and she hosted sewing circles in her home? I’m with Florence today. I found her writings on faith informing her work so challenging and inspiring. She has the saintly depth I’m looking for in a hero for today. Florence “has the saintly depth I’m looking for in a hero for today.” Very well put. The evidence of Amelia’s faith was that the sewing circles clothed the poor, as Jesus’ requested. Please do not trivialize the ancient craft of community-weaving, it is the woman’s way to learn to claim their own power. In Amelia’s day, it was one of the few opportunities available to women to do so. The conversations during the circles also gave the women social support to speak their own minds, their own truths, experiencing the necessary solidarity to “step out of their place”. Those sewing circles were cradles for the newly birthed in the women’s movement. Amelia did much, much more besides her sewing circles, but without solidarity and learning leadership, the women’s movement would have never developed the muscle necessary for women to step out of their place and into their rightful roles as leaders and as fully enfranchised citizens. Thanks for all the beautiful writing, today and throughout our season of Madness. Halos for the house! Really tough choice. I’d like to vote for both of them. It’s Florence all the way for me! Oh, Anna – what a truly magnificent portrayal of Florence! I was right there with her, smelling, seeing, crying. Yes! I was all set to vote for Amelia until I read your post, Anna. You made Ms. Nightingale come alive. “She wonders if her fellow doctors and nurses see the face of God in their patients as she does.” Yes, Florence, I have experienced that too! This brought a flood of memories and tears. This line spoke to me as well, in part because I am giving a short lay meditation on Good Friday. The meditation is on St. Veronica. I will speak of not only seeing the very image of Jesus on the cloth that St. Veronica used to wipe his face, but more importantly to look for the very image of Jesus in the faces of all those around us. I love The Lady With The Lamp, but I had to stick with Amelia. I just think we’re a lot alike in many ways. Come on, Amelia! Voted for Florence, as I thought I would, but Amelia’s write-up very nearly changed my vote. Two women who worked hard against the grain of the expectations of their time, at personal cost to themselves, to make life better for others. Florence was perhaps more altruistic, and her work has had a massive impact on the health and wellbeing of millions since her time. But the Golden Halo tomorrow will be a tough one! You’ll never get people who want gluten free bread/wafers to agree that taking one element is equal to taking both! Yes, the Eucharist was celebrated much less frequently, but I doubt if there would have been much acceptance in the 19th c. of the idea of receiving the bread only, except in a handful of Anglo-Catholic parishes, and I assume Ms. B. was on the other end of the spectrum. Since one element is as good as both, this would seem a bit irrelevant. Several friends of mine only take the wafer, and it is nobody’s business. The founder of nursing has been internationally recognized; her name’s a household word. Amelia is recognized as one of those who spearheaded the movement that made votes for women a reality. And she is virtually forgotten today. I think some of us think that this is a sad state of affairs. I hope Clara Barton doesn’t get put in the rota for next year. Give some others a chance too! Throughout Lent Madness this year, I’ve been trying to vote consistently for specifically Anglican saints. This match-up is our final opportunity to choose between two such people. Though both women were no doubt influential in their time, I’m voting for Florence because of her writing on how her faith influenced her work. It’s always important to know why you’re doing what you’re doing. Well said, Corban. Though I haven’t been voting preferentially for Anglicans, I have preferred those in whose lives there was a clear connection between faith and life. I see that connection in Florence’s life, but not so much in Amelia’s. Florence gets my vote today. I haven’t voted for either of them in past rounds. What a difficult choice today!! Anna’s beautiful post about Florence nearly swayed me! But, I am voting for unsung Amelia! I admire what she did to improve the lives of women. Though the long Night’ of winter seems daunting, the Bloom of spring is eternal. We need you Amelia. This is your time! I’m rooting for a come-from-behind surprise win. Florence gets my vote, but Amelia’s contribution is also vital. This contest was my first real exposure to Florence Nightingale. I’m truly amazed by her. Pulling for her all the way. Good bless Amelia. Florence is my heroine and saint for today. I love Anna Courie’s piece on Florence! Florence Nightingale, in yet another tough choice. Last night’s broadcast of “The Great War” showed me the scope of injury and death in war. “Overwhelming” can’t begin to describe what medical personnel have to deal with. She was beyond heroic. The Hidden Figures story comes to mind: some speak up, go on marches, launch protests, while others ‘simply’ DO. Both are needed. But the comments suggest at least that Amelia’s work lacked credit to Creator, while Florence was clear her doing relied upon God’s strength. Linda Sylvester and Karen Sharp — Excellent comments! Remembering the night I made a pre-op visit to a man with gangrene, who welcomed this chaplain and talked for hours…Florence Nightingale was not only the forerunner for today’s nurses, but for chaplains as well. How could I vote for anyone else? The essay for Florence Nightengale was so beautifully written it left me no option but to give her my vote. Thank you. In any case, may a woman win the Golden Halo this year,. Ok, some probably see Amelia’s views on alcohol as extreme. Sometimes we have to find a tactical way to begin to address a systemic problem. Alcohol sucked household money and kept men from home. Changing a culture is the most difficult thing to do. It took tough-minded women to stand up for those who hold up half the sky. Go Amelia! Amen! It’s not too late. And without the temperance movement, women’s suffrage would not have happened then, and one has to wonder if and when (yes: “IF”!!) it would have finally happened. No temperance movement, no votes for women. No votes for women, no Frances Perkins, no New Deal. FDR without Frances trying to fix the Great Depression — Lord have Mercy! This was a hard choice. I believe we have to show a support for women’s rights, especially now. In this case, either way you are voting for a woman, so in a sense either way you are voting for women’s rights. I went with Amelia, though, because she was the obvious choice in that regard but more to the point because I was afraid more people were voting for Florence. So far, I was right. I don’t care which one of them wins, they are both great, but I do hope that Amelia gets a little closer to Florence Nightingale. As the mother of a daughter who is an Army National Guard medic and whose family tree includes Susan B. Anthony, I am hard pressed to choose between these two heroes. But it will have to be Florence who sees the face of God in the wounded and dying, just as my daughter will if she has to be deployed. The images for Amelia are uncredited. The writing by Anna about Florence is excellent. I predict the winner of the Golden Halo have a baptismal name that starts with F and a long last name. You are droll today. I concur. Truly a tough choice today between two very influential and saintly women. And it will be an even tougher decision tomorrow. Kudos to the celebrity bloggers on the write-ups. As a nurse I once again MUST vote for Flo! She taught her nurses the importance of hand washing between each patient, an idea that doctors of the day didn’t quite believe in. Go on Flo and keep washing your hands. I can’t believe this “Madness” is almost over! This was another difficult matchup to choose from. Voted for Flo. And thanks, Diana for the wonderful hymns! I am heartened to see that Florence is ahead but the day is just nicely beginning. Florence lived out her faith and shared it. Her contributions to modern sanitary nursing and hospital care are so important. I won’t get into the women’s right issue, but Amelia’s temperance efforts anger me. Not eat in home where alcohol is served! Not bake with alcohol (the alcohol is no longer intoxicating in cooked food). This is extremism, always scary. In her day, and still today, it seems to be easier to attack the “thing” causing a social evil — guns, drugs, alcohol. At least today we have the benefit of psychology. But still, the “thing” is attacked but the root of the evil still remains. I am the grandchild of two Eastern European immigrants of the early 20th century, not much different culturally from the 19th. My grandfather was married at 19 to an 18 year old girl. They had nine children, 7 of whom lived to adulthood. They lived in a tiny mill house in an ugly mill town where the air was permeated with the smell of sulfur from the paper mill my granddad worked in for 50 years. It was clear from his dress, his table manners, and his social graces that he had come from a wealthy and educated family. But these were evident only when he was sober, which was rare till he retired and finally got to live with a daughter in Tampa . Why was he an alcoholic? I am convinced he was for the same reason that thousands and thousands of the men Amelia lectured were alcoholic. Many of them were uprooted from their home and culture, did not have the opportunity or time to learn English as they worked tiring, boring jobs in a factory. Their tiny homes were full of babies and children and teens, their tired wives were often angry and nagging. And the local bar was an escape where they could speak their language, have “guy talk,” and assuage their loneliness, anger and frustration. I would have more respect for Amelia if she had addressed the reasons why so many men were alcoholic and mistreated their wives. No one seemed to ever look at WHY the men did this. It might not have been true of all, of course, but it certainly would have been a start. Certainly food for thought. And also appropriate when considering present-day addiction to opiates and/or meth which seem to be the equivalent of the cheap alcohol sold in the 19th century. So well put. It is so easy to condemn the “thing.” and ignore the cause. We are still doing it. Children misuse swings in a school ground, so swings are banned from school grounds. Prohibitionists set my teeth on edge. They are extremists, who make life a lot less pleasant. Yes, I believe that prudery is NEVER a sign of holiness. So the temperance movement angers you? Does it mean nothing at all that were it not for the Temperance movement there would have been no votes for women? Sorry, but it is necessary to see actions in those times as rooted in the events of those times, and darn it, no “yes, but” about it! Women had no say, and men drank away what wages they had, and, Oh my! It’s much too extreme to try to do something about it, isn’t it? After all, we cannot limit the rights of those hard-working men, can we? Men will be men, after all. Women are just chattel, and should darn well know their place. That is the thinking, unfortunately, and we still have a lot of it going around in comments of those who know what they know, and do not want to count the cost. I don’t agree at all with the temperance position, but I can understand it, and I have to respect it, and you ought to also, with all due respect. An incredibly difficult choice today and tomorrow will be more so. While Franz’ actions and faith were admirable, they were also more personal. Florence was the Mother Teresa of her time, seeing Jesus in every face, and she made incredibly important contributions to medicine through her teachings on hygiene. Yes, but did she influence our undergarments? This was the hardest decision in this year’s bracket!! Congrats to Laurie and Anna for terrific writing this morning. The journalism Pulitzers were awarded yesterday. They missed the genre for evangelism, the good news that, like poetry, stays news we need! Anna’s tactile narrative moved me to vote for Florence Nightingale. Her emphasis was the environment, and I comprehend that expansively, as the larger conditions we all live in together: natural, social, technological, and political. In Easter and Pentecost, I hope all our ministries for bringing good news to the world, together, will be blessed. Yes both of the writers did a superb job. Just a little hyperbole from one who believes in the germ theory…if you have ever had surgery you might not be alive to vote for anyone without Florence. Then speaking as a Cassandran (AKA Radical Feminist Nurse), she inspired generations of feminists and continues to have an influence in nursing and feminism in 2017. Going for the Golden Halo…Go Flo! Evan as a nurse, I’m voting for Amelia. Maybe especially as a nurse. Alcohol abuse was the “opioid epidemic” of her day, and she addressed it. And she gave women a voice in an era in which they were routinely silenced. With such descriptive writing, how could we not choose Florence?! That really put us in her shoes and helps us understand her better. Part of me wants Amelia to go all the way just to see how the SEC would honor her — because a pint glass would be singularly inappropriate for Amelia the teetotaler. And Golden Halo bloomers…no. Just no. But please no more coffee mugs. Most people who like coffee (or tea or cocoa) already have a favorite mug and those who don’t like hot beverages don’t need yet another mug. I think I would have to buy Golden Halo bloomers, how could I not? Both Celebrity Bloggers have done a beautiful job today. It appears that Florence is going to win in a landslide, but I have cast my vote for Amelia. It would be easy to dismiss her temperance activities (and many have) as prudery, but Laurie Brock’s description of true conditions lends an important light to the issue. Her willingness to stay in the church and work for change also speaks strongly to me. Well done, Amelia, well done! And thanks for the underwear! Florence! “… fresh air, clean hands, and clean linens… She wonders how to teach people the basic necessities of life that should be available to all.” Go with the Flo! One post said the writer was a nurse but was voting for Amelia. I’m a journalist but voted for Florence, although all I really wanted to do was vote “yes” for both. What a choice. And I think it’s going to get even harder. The Celebrity Bloggers have been outstanding the whole way. What a difficult choice today. Both women deserve votes. I finally went with Flo as she was dealing with actual hands-on help for all her work. This season, it seems we have had more of people who were actual “saints” in the traditional definition. So many great examples for us. Still going with the Flo.. . . Where are all the ‘brethren?’ Their voices seem to be missing in today’s comments. . . just saying. Florence today but I think it’s going to be Franz in the long run. Tough choices. Another difficult decision today. Wonderful write ups from the celebrity bloggers, as has been true throughout. I cast my vote for Florence, who was denied the opportunity to serve God within the church, yet undaunted used her gifts in his service. For my mother, nurse and healer, I voted for Flossie. Such lovely write ups, Laurie and Anna. Go with Flo! Deciding between these two women was difficult; it hadn’t occurred to me that they were contemporaries and that, in their different ways, both did a lot to bring about changes that I take for granted. Hats off to the celebrity bloggers who have brought me to tears today: I identify strongly with Amelia and my mom was a nurse. Today’s vote pushed me to independent research but I voted with my heart and let myself go with the Flo. It could have happened that these two women served as inspiration for each other during their lifetimes!! I thought I was going to vote for Florence, but because it is my niece’s 23rd birthday today, I went with Amelia who did so much for women’s rights and who struggled with the patriarchal church structure. But I will be happy if Flo wins! The writing here is always exceptional and Spirit-filled, but the final paragraph of Florence’s essay gave me chills. “Let’s get you well.” The work of the Church, writ both small and large. Beautiful, and thank you! I marched in the women’s march this last January because of and in honor of women like Amelia in hope that my 12 year-old daughter will never have to demonstrate for women’s rights and dignity in the future. Florence is a worthy saint who captures my imagination and emotions, so I am sorry that I have to make such a choice, but I have to vote for Amelia. For DFW folks, there is a collection of Florence Nightingale information/memorabilia at Texas Womens University’s Huey Library! On 4/21 at 2, the collector, Dr. Paterniti, will speak on his amazing collection. Laurie and Anna, thank you both for such beautiful, prayerful write-ups today. You and your fellow CBers have led this Lent Madness into a deep understanding of what it means to be faithful in this world. Blessings (and Pulitizers!!) to you all. the writing about Florence made me tear up. Flo for the win! Were people paid in bars? “… her gender dependent upon wages brought home by husbands, the same wages readily spent at pubs and bars where pay was distributed.” Thanks for a great article. Ok, so many of my favorites have fallen out of contention, but Florence is still in it, to win it!! This was a no-brainer for me. In spite of Amelia’s work to promote the cause of women and the invention of comfortable bloomers I felt her bias re temperance a bit much. How did she treat the Eucharist in her Episcopal Church or was this a grape juice church. Also instead of not dining in a home that served alcohol, she could have attended and restrained from imbibing. It would have been a great opportunity for Amelia to show her hosts one could enjoy themselves without using alcohol. In some cases non-verbal preaching can have a better impact. So Florence definitely got my vote. I wonder how often she had to revert to poring whiskey over a wound or serve a wounded soldier a swig or two to deaden pain? Just saying! I’m not sure if any Episcopal parishes in Amelia’s day would have used grape juice for the Eucharist. In any event, the process for reliably preventing grape juice from fermenting into wine was still a few decades away from being developed. Perhaps Ms. B. would have been a bread-only communicant. In any event, I also agree with the rest of your comments. Some years ago our church did a series on men and women who were official, unofficial, or otherwise qualified to be saints. One of the women covered was Florence Nightengale. She was an active menber of the Church of England, and her faith is what brought her to her nursing vocation. I admire what Amelia Bloomer did, and voted for her at least once in this series, but my vote must go to Florence. My Great a Uncle Joe was a doctor, his younger sister (my grandma) was his assistant, and my cousin is a registered nurse, therefore, Florence Nightingale earns my vote! As an old soldier, I have seen Florence Nightengale at work in Army nurses and Red Cross Donut Dollies at work in combat zones. When the differences were needed, they made it. When a soldier died on the battlefield, they cried but carried on. Florence Nightengale represents the best in both women and men who serve and heal. I voted for the Lady with the Lamp. We haven’t seen this big of a difference in the votes for a while now! It is surprisingly refreshing. Two strong contenders, today. I voted for Florence three times in the past, while I voted for Amelia twice. I voted for Florence because of her own costly service to those in need during the Crimean War (service that had the effect of ruining her own health for the rest of her life in the process), and for her foundation of the values and ethos of the modern nursing profession. While I honour Ms. B.’s commitment to achieving full citizenship rights for women, I feel that she crossed the line into prudery in her temperance activities, particularly by never dining in homes in which alcohol was served. I believe that true holiness is NEVER prudish. I’ve been predicting a Nightingale-Jägerstätter final since Franz’s first appearance. Now, as it could be a reality, I’m on the horns of a dilemma: How will I vote tomorrow? Will it be the battlefield nurse or the conscientious objector? However it ends, I hope for a close one. Voted in honor of Great Aunt Julia, Aunt Katie, my beloved sister Nancy, and a few ciusibs who are the newest nursing students. God bless all your hearts and hands! I find myself very sad about the probable outcome of this vote. We need nurses, don’t get me wrong. But, eventually a man would have done what Florence did, and nurses would probably make more money today! But, only a woman could have stood up to say, stop counting us as bit children! And, today, we are in danger of falling so far back in the progress we have made to date. I am sad, sad, sad. On the other hand, we’re choosing a person, not a profession. Amelia Bloomer is a more difficult woman to appreciate (which was probably true in her lifetime as well as in ours). Both devoted their energy and creativity to their visions of God’s purposes for humanity. I voted for Amelia because she’s losing and she’s harder to sentimentalize. Very hard choice again today. But as a fellow nurse, as so many of us are, I am voting for Florence. One has only to experience first hand, as many of us have, the smells and sights that Florence did and with no help from Doctors. For my mother, for my mother-in-love, for my niece, for several young women in my church who are nurses or soon-to-be nurses, for the many nurses (female and male) who have provided care and comfort over the years to me and my loved ones — the Lady with the Lamp. Nightingale a Unitarian in her younger years. My name is Zoey, and I love Florence nightingale. She helped so many. Mums comment – what a tough vote!!!! Great reason Zoey. I’m so glad you are taking part in Lent Madness this year, and hope you will be back next year, too. Florence truly did God’s work, saving lives and bringing comfort to the sorely afflicted. AND she was Anglican. I voted for Florence in her last battle. My mom and step mom are retired nurses. I have friends that are nurses. BUT AMIELIA IS MY VOTE. Woman’s rights activist with a commpstionate soul. My wife and I surprised ourselves today by voting for Amelia. When we learned that she “frequently clashed with other women’s rights advocates for her unwillingness to condemn the Church outright, arguing she preferred to reform the Church from the inside as a member”, that won Amelia our votes. Thank you, Laurie Brock, for this information. Amelia worked longer and harder. Florence’s work was complete by the time she was thirty. Darn, and here I was hoping Amelia might win this thing. Fantastic write up for Florence Nightingale, all the same. Just checking in on the voting before I go to bed – Pacific time, it’s actually pretty early. I took a moment and re-read the write-ups for both ladies and it occurred to me that through this exercise of Lent Madness, I’ve come to appreciate FloN’gale so much. She totally reminds me of an early version of Mother Theresa! This was a tough one! 2 inspirations, for sure. I am partly very pulled towards a suffragette, writer of the first women’s paper, and I am so glad I’m not in crinoline! (Sad to hear that Amelia went back to that fashion.) And I have always thought of nursing as more a profession than a calling. Though heaven knows, the good nurses have made a world of difference for myself & my family in our most dire need. And having read above, and both entries in wikipedia, I do see Florence’s vocation as a calling, and in the comments I read of many called nurses. What finally tipped me though was learning that Florence was not only called to nursing, and reading in some detail of all the lives she changed and systematic improvements she made, but she was also a literary author AND a statistician! From wikipedia: “Later, Nightingale became a pioneer in the visual presentation of information and statistical graphics. She used methods such as the pie chart, which had first been developed by William Playfair in 1801. While taken for granted now, it was at the time a relatively novel method of presenting data.” How can I NOT vote for a person who brought us the PIE CHART?! Florence it is!! Though I just voted for Amelia, without reading, I am impressed with the fact that this forum gives voice to the quiet servants, like Florence, who just get up, put their shoes on, and get to work. The world is much better for Amelia, and I love her strong character and community based engagement. Twin stitches in a single fabric, just different colored yarn. I probably would not have changed my vote if I had read all, but if the nurses of the world had a march I would join it, but nurses generally would not as there are more important duties that wait. Hurrah for the warm coat that has been made. Perhaps I will share mine with a homeless person. Night all! Hey, how come this page without the vote button came up??? I haven’t voted today and if Bloomer loses by one vote, I’m heading for the SEC!